Distribution: southern hemisphere only, summer months mainly below 60Â°S to 65Â°S, while some remain in Antarctica in the winter the proportion is not known and many disperse to other places in the oceans of the southern hemisphere. 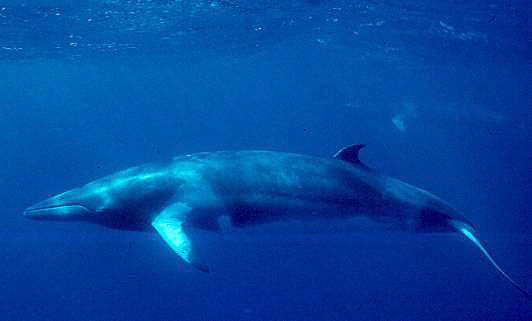 Minke whales (pronounced Minky) are the smallest of the rorqual whales (whales that have baleen or "whalebone" instead of teeth that they use for filter feeding). What used to be thought of as distinct northern hemisphere and southern hemisphere sub-species have now been shown to be two different species. The northern species Balaenoptera acutorostrata (the "dwarf" minke whale) is slightly smaller than the Antarctic Minke Whale, Balaenoptera bonaerensis, While the northern species is sometimes found in Antarctica, the southern species is thought not to cross the equator. As the smallest rorquals, minkes were the last to be exploited by whalers when the larger animals had been reduced to a level where they were no longer able to be profitably exploited, so the minkes were targeted as the species of last choice. Minkes are fast swimming - over 20 kph, meaning that they are difficult to catch as well as being a relatively small catch. Minkes are still hunted for "scientific" reasons by Japan, though large quantities of the meat turns up in very expensive restaurants and in markets. What is actually being "researched" is when it might be viable to resume active commercial whaling. Like other rorquals, minkes migrate to tropical or warm temperate waters in the winter months and spend the summer months at higher latitudes in polar waters where the long day length leads to algal blooms in the sea and associated increases in plankton and fish stocks means good a feeding time. Minke whales are generally solitary animals or they are seen in pairs or threes. Larger groups are sometimes found in high latitudes in both hemispheres and groups may number 10 to 15 individuals. Minkes often approach boats, especially when stationary, and are notoriously inquisitive, as such they are more likely to be seen closely than other rorquals.